Want to use up that salmon you cooked up last night? Here is a great, quick recipe for a pate as a mid-day snack or appetizer for your next gathering. In small bowl, mix goat cheese, yogurt, and oregano. Flake salmon. We prefer left over cooked salmon which has been baked with spices. However you can use canned salmon if you prefer. Fold in flaked salmon into goat cheese mixture. Roast pecans in oven at 400° F for about 7 minutes, turning once half way. Let cool and chop. 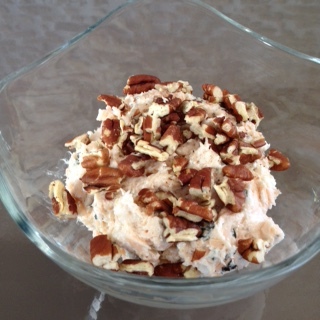 Sprinkle pecan pieces on pate. Serve with veggies or whole grain crackers.